Not just famous for The Beatles and its music heritage, Liverpool also has the largest collection of museums and galleries in the UK outside London. This tour includes a step on guided tour of this fascinating city, a Ferry cross the Mersey and a tour of the beautiful Port Sunlight village followed by a full afternoon tea. 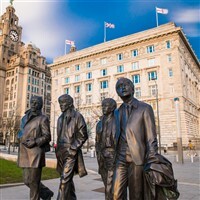 Wednesday  After a full English breakfast we will enjoy a fully guided tour (by coach) of the city of Liverpool, including Penny Lane and Strawberry fields. After a mornings tour with our guide you will have the rest of the day to explore this lovely city from the famous Albert Dock. Thursday  This morning we return to the city and head for the Ferry cross the Mersey for a 50-minute round trip with wonderful views as we glide across and along the river. After our cruise we join the coach and head for the beautiful Wirral, with it miles of coastline and seaside villages. We will be taking you to the most famous of these villages Port Sunlight, built at the end of the 19th century and originally the Lever factory. Over 30 different architects were involved in the building of the village and the result is an intoxicating mix of architectural styles enhanced in a beautiful park setting. We will have a step on guided tour of the village before returning to the museum and a full delicious traditional afternoon tea in the museum restaurant. Friday  We leave our hotel and continue to the beautiful city of Chester for a lunchtime stop before continuing back to Wiltshire and our taxis to take you safely back home after a memorable summer break in and around lovely Liverpool. Set in the beautiful North Welsh countryside, this comfortable hotel offers an informal relaxed atmosphere within tasteful furnishings and excellent cuisine. All bedrooms are en-suite with TV and hospitality tray. Although this hotel doesnt have a lift, there are ground floor bedrooms on request.